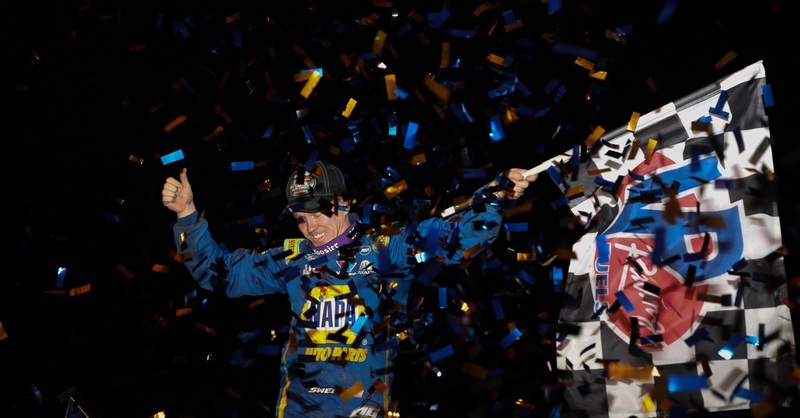 Ron Capps won his 56th NHRA national event title on Sunday at Route 66 Raceway near Chicago, and it likely was the most difficult for him to celebrate. 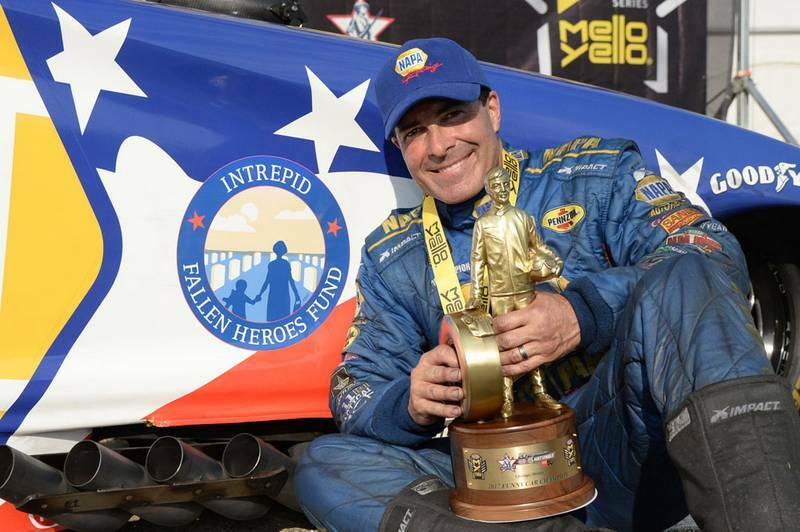 The driver of the NAPA Intrepid Fallen Heroes Dodge Charger R/T Powered by Pennzoil posted a career-best sixth title of the NHRA Mello Yello Drag Racing Series season in only 13 races and extended his championship points lead to 186. 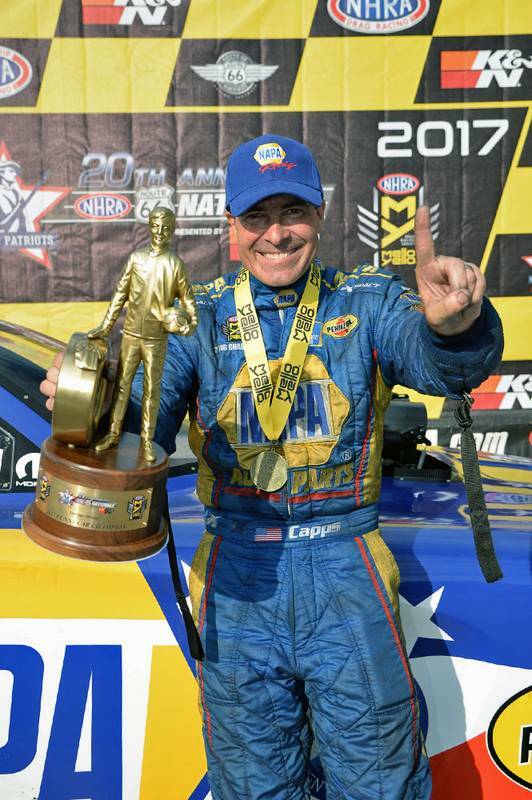 But to collect the NHRA Wally Trophy, he had to beat Don Schumacher Racing teammate Tommy Johnson Jr. driving the Make-A-Wish Dodge that is funded by the late Terry Chandler, who died on the Fourth of July after a valiant three-month battle with brain cancer and was laid to rest Saturday in New Mexico. 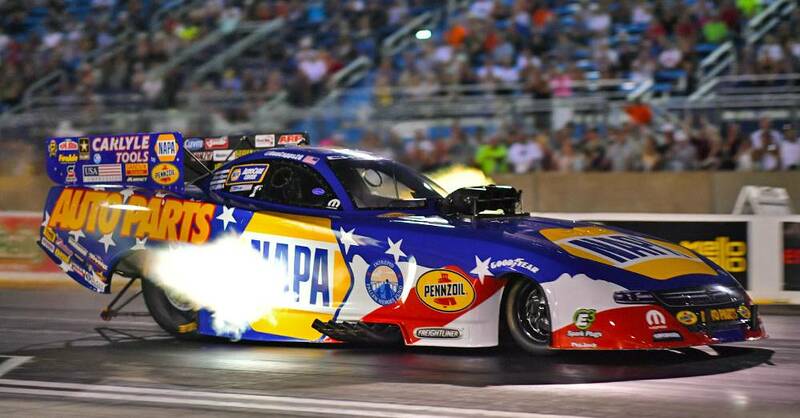 “She loved drag racing so much,” Capps said. 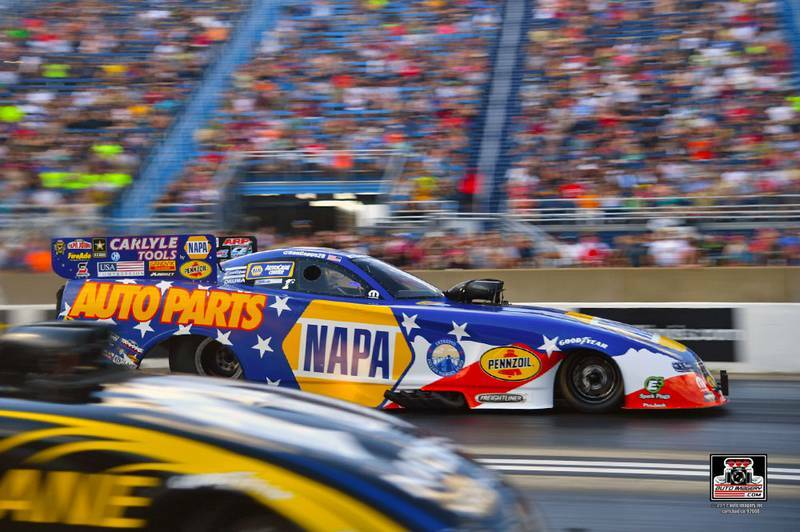 In the final round, Capps’ 4.026-second run at 319.67 mph edged Johnson’s 4.047 at 319.90. 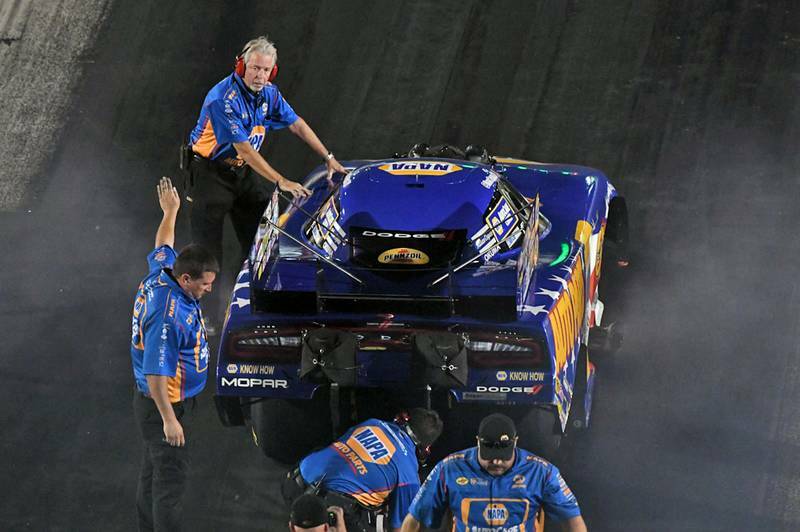 “My job is to win and that’s what our NAPA Intrepid Fallen Heroes Dodge was able to do,” said Capps, whose crew chief Rahn Tobler won for the 60th time. “That’s our job, but I wouldn’t have been sad had Tommy beat us. 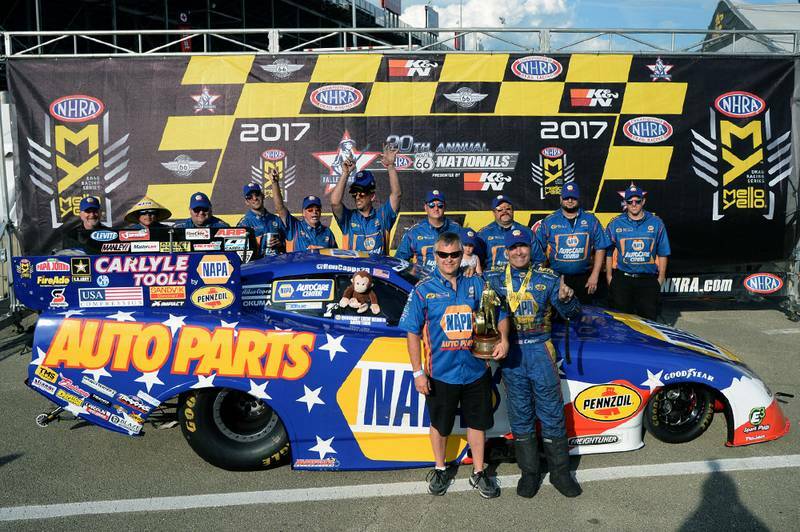 Capps with the NAPA AutoCare Centers crew has built their championship lead with consistency and near flawless raceday preparation by Tobler and assistant Eric Lane instead of by setting track records. 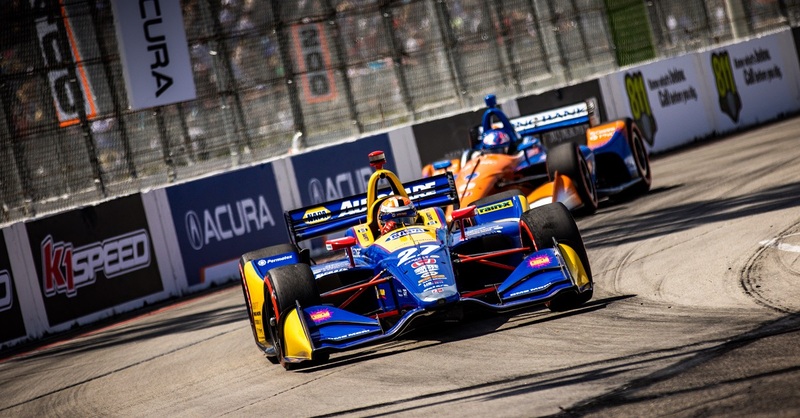 At Route 66, their best qualifying effort could only muster a No. 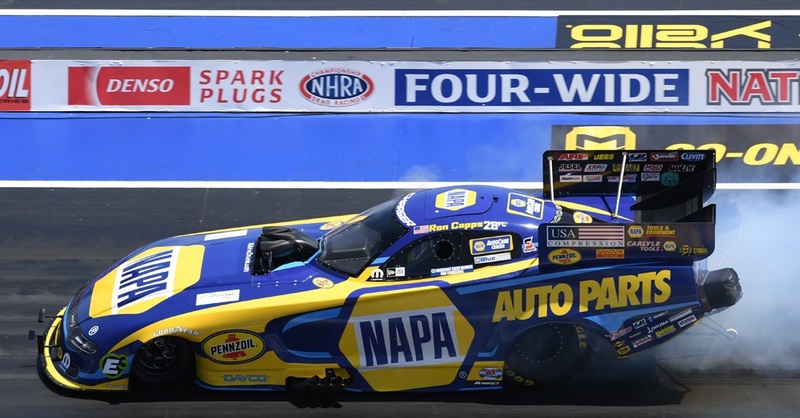 9 seed for Sunday that gave lane choice to rookie Jonnie Lindberg in the first round when Capps recorded his best time of the time of the day to win. 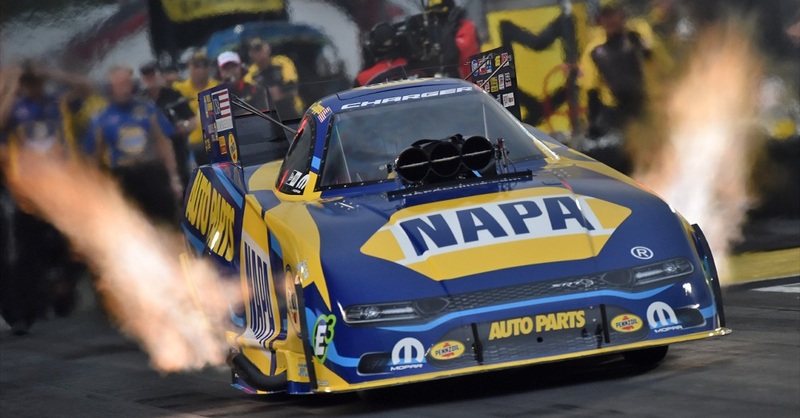 After his next opponent lost traction, Capps edged past Don Schumacher Racing teammates Matt Hagan, who is second in points, and then Johnson to earn the 55th NHRA Funny Car Wally Trophy of his career. Start / Finish: Qualified No. 9 / won in championship round over DSR teammate Tommy Johnson Jr.